In the past six months, MSF has cared for hundreds of women facing complicated deliveries at its emergency obstetrics program in Balochistan. 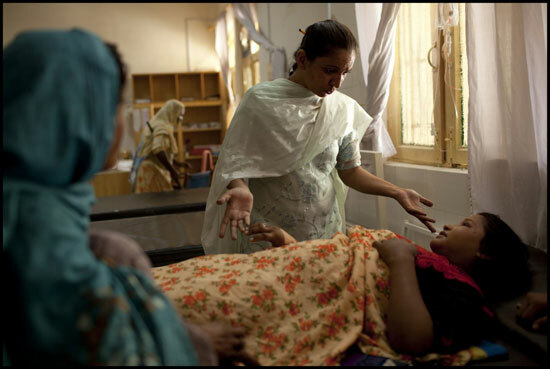 An MSF staff member provides a consulation to an expectant mother at the Derad Murad Jamali project. Gulatun’s home today is a makeshift shelter in an open area on the outskirts of Dera Murad Jamali in Pakistan’s Balochistan province. She is one of the millions of people who were displaced by the devastating floods that destroyed homes and livelihoods in massive swathes of the country. In the bed next to Gulatun at the Mother and Child Hospital in Dera Murad Jamali is Haseena, who is pregnant for the ninth time. Only four of her previous pregnancies have come to term, however, and now, in the last month of her pregnancy, she has a prolapsed uterus that has her praying for her unborn baby’s survival. “I hope my husband will allow me to have a Caesarean section and my baby will be fine,” she says. Haseena and Gulatun are among the hundreds of women facing complicated deliveries who have been admitted to the inpatient department of the hospital since Médecins Sans Frontières/Doctors Without Borders (MSF) started offering free emergency obstetric services at its program in Balochistan this past March. Services offered include non-surgical deliveries, Caesarean sections (C-sections), neonatal, antenatal, and postnatal care. Even before the floods, there was a critical lack of maternal health care for expectant mothers in Pakistan’s rural areas. Most women give birth at home in unhygienic conditions with the help of a private midwife—or dai, as it’s known in the local language, Urdu—leaving them more exposed to deadly infections. The floods have worsened the situation, making it even harder to access the few facilities that offer medical care and putting thousands of women at greater risk of having miscarriages or even of dying during childbirth. The case of Jamila, who just gave birth to a baby boy, illustrates the dangers. “I felt pain in my body and had fever during the last five months of my pregnancy,” she says. “But I thought it was a normal part of being pregnant, so I never went to a doctor.” It turns out that her pain and fevers were symptoms of cerebral malaria contracted during her pregnancy. She was lucky to survive and is now finally receiving proper care in the hospital. Furthermore, Dr. Ekdahl notes that in Pakistan, a drug called oxytocin is often used excessively or improperly during deliveries. Oxytocin is a naturally occurring hormone that is released into the bloodstream during labor. If administered in the correct dose at the right time, synthetic oxytocin can assist with delayed labor. However, if given unnecessarily, at the wrong time, or in the wrong dose, it can cause mothers to super-contract. This not only harms the baby but it can also cause a woman’s uterus to rupture and lead to maternal or infant deaths. The babies that are born in the MSF-run maternity ward are transferred to an around-the-clock nursery next to the inpatient department. Most of the babies admitted here are treated for prematurity, birth asphyxia, tetanus, or jaundice. The nursery also admits infants who are delivered in other locations but need intensive post-delivery care. Since March, MSF has conducted 339 deliveries in Dera Murad Jamal, 244 of which were complicated and 41 of which were C sections. The majority of these mothers would have died without the MSF service. MSF has also admitted 247 newborns to the nursery. Dr. Ekdahl smiles when she reports that Haseena, two days after being admitted, gave birth to a healthy baby boy—her husband had consented to the c-section—while Jamila is recovering from her malaria and her baby daughter is doing well. Since 1988, MSF has been providing medical assistance to Pakistani nationals and Afghan refugees suffering from the effects of armed conflicts, poor access to health care and natural disasters in Khyber Pakhtunkhwa, Balochistan, Sindh, and Punjab provinces, in the Federally Administered Tribal Areas, and in Kashmir. MSF does not accept funding from any government for its work in Pakistan and chooses to rely solely on private donations.